Both the European Union and Japan have been major beneficiaries and supporters of the liberal international order, first led by the United States since the end of World War II. During this period, they have emerged as global powers, however, the very order that nurtured their rise is now facing twin threats. First, through authoritarian China’s promotion of alternative models of global governance, and second from a crisis of liberalism, manifested in the policies of President Donald Trump and Brexit. This book explores these challenges faced by both the EU and Japan, providing a multidisciplinary approach to studying the relationship between the two. It analyses their cooperation in terms of security, defence and trade and examines how their shared normative values are ultimately implemented. Having recently concluded an Economic Partnership Agreement and with a Strategic Partnership Agreement in the pipeline, this book asks whether they can convert their latent and modest cooperation into an alternative form of leadership and an antidote to the illiberal tide sweeping the developed world? 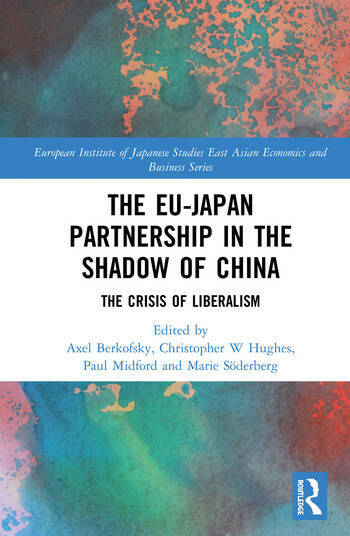 As the first book to shed light on the new Economic Partnership Agreement between the EU and Japan, this book will be useful to students and scholars of Japanese Studies, as well as European Union politics and international political economy more generally. Axel Berkofsky is Senior Lecturer at the University of Pavia, Italy, Senior Associate Research Fellow at the Milan-based Istituto per gli Studi di Politica Internazionale (ISPI) and Research Affiliate at the European Centre for Japanese Studies at the Stockholm School of Economics, Sweden. Christopher W. Hughes is Professor of International Politics and Japanese Studies at the University of Warwick, UK. He is the author of Japan’s Foreign and Security Policy under the ‘Abe Doctrine’ (2015), and co-editor of The Pacific Review. Norwegian University of Science and Technology in Trondheim, Norway. He is the author of Rethinking Japanese Public Opinion and Security: From Pacifism to Realism? (2011). Marie Söderberg is a Professor and Director of the European Institute of Japanese Studies at the Stockholm School of Economics, Sweden. She is also the chairperson of the European Japan Advanced Research Network executive committee.